Well, Everton fans will have a spring in their step when they go to work tomorrow. Sunderland fans? Surely it can only get better, to quote D:Ream. Anyway, I'm outta here now - Jonathan Jurejko is your man for coverage of Southampton v Bournemouth. That game kicks off shortly over here. It matters very little, but Jermain Defoe has bagged more away goals at Goodison Park than at any other PL ground (5). Chris Greenwood, West Hampstead: Weren't Everton fans calling for Martinez to be sacked not so long ago? Just shows what happens when clubs put faith in good managers and good players. "It was a fantastic game to watch first and foremost. From our point of view, we knew Sunderland had changed their system to make it difficult for us. But the movement and composure in possession was special. To score six - and we could have scored more - it was outstanding. It was special. "We got in between spaces really well. Sometimes your attacking pattern can become predictable. But the way we used the space and the interplay between our attacking players - it was a complete performance. "We had a two-goal lead so it was a huge blow to concede before half-time and then suddenly we have something to lose. You need to understand how to play the game after conceding the second. They did that very well." [On Arouna Kone] "His springboard was against Watford on the opening day. He had a career-threatening knee-injury but when he came on against Watford, to show he could help the team and perform, it was an incredible turning point. Since then we have seen a very good footballer." Big Sam is being interviewed now. He seems fairly relaxed in the circumstances. You know it's been a bad day at the office when the red spots on your team heat map are in the centre circle, from having to kick off so many times! Here's how the table now looks for you, Everton fans. And here's what the number crunchers thought of it all. "It was end to end. Not the plan we had. The goal before half-time changed it a bit. Second half, some of our attacking play was really good. "The plan was to get down the sides. It was the one-twos around the box that paid off and we took our chances when they came. "At the end of my career I will look back at having played so many games. While I'm still playing I have to keep enjoying it. My body is good. I'll take it a season as a time." Paul Scully: Nice to see all the Sunderland players go over to their supporters. They couldn't get off the pitch quicker. Mark Taylor: Big Sam surely one of the EPL worst managers. Yes, I have just been sacked again but I'm your man. OK the jobs yours then. Everton supporters will be pleased to see Ross Barkley's stats from today. He played more passes than anyone else and his passing accuracy of 94.3% was only bettered by John Stones (95.2%). He's clearly improving. Romelu Lukaku was seriously good in the number 10 role today - here's his heat map, showing where he did the damage. Arouna Kone looks pretty chuffed with the matchball as he marches off with it in his hand. And so he should - what a superb display from Everton. Oh to be a fly on the wall of the Sunderland dressing room once Big Sam gets rid of the gum and tears into his players. Dave Payn: It seems that at times, the only games Sunderland are switched on for are the ones v Newcastle. Arouna Kone, by the way, is the fifth different Ivorian to score a Premier League hat-trick - after Didier Drogba, Arouna Dindane, Yaya Toure and Saloman Kalou. A chance for Sunderland to add a consolation but Duncan Watmore lacks composure and, after breaking into the box unmarked, his lob is easily saved by Tim Howard who just sticks out a hand and diverts it away from danger. Kevin Mirallas curls a shot wide. Everton want seven - they continue to pour forward. Sunderland's defence might be 'iffy', to say the least, but Everton's front three has looked the business today. 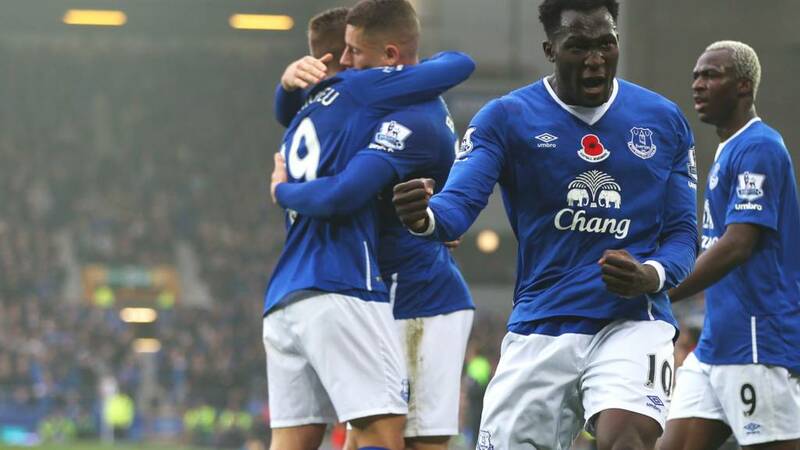 Gerard Deulofeu and Romelu Lukaku deliver the bullets and Arouna Kone does the rest. There's a great understanding between the three of them. Jamie Anderson: Not to say I told you so to everyone I told but a back three against Lukaku and Kone? What was Sam thinking? Where's the ten men behind the ball we should have been deploying? Niall Hughes: How many managers do Sunderland have to go through before they improve their centre backs. Been awful since Bruce was in charge. Tom Gardner: I'll bet fifty quid Sam Allardyce has Kevin Nolan signed up within the week after this result/ performance. One of my favourite Yorkshiremen Jonathan Jurejko is whirring into life for a dedicated live text of Southampton v Bournemouth. You can join JJ over here. Romelu Lukaku's work is done and he is replaced by Leon Osman. And what a shift from the big Belgian, who looks the part as a number 10 - pulling the strings and orchestrating the Toffees attack. A display Teddy Sheringham would have been proud of. James Bremner: Can I get a mention for the great refereeing at #EVESUN. Free flowing football needs a good referee, not a centre of attention. You need to watch Match of the Day 2 later just to see Romelu Lukaku's cross. It's a sublime effort with the outside of his boot to pick out Arouna Kone, who makes no mistake from 10 yards out to ensure he'll be taking the match ball home tonight. We'll get Romelu, Arouna and Ross to look into your technical issues, Steve (see tweet below). I'm sure normal service will be resumed soon. Sorry Sunderland fans. It's best to laugh. If not, you'll cry. Steve Fletcher: What's going on ? No reports of a goal for at least 5 mins. Is it a technical fault? Everton almost make it 6 (six) when Kevin Mirallas breaks through the middle but he's forced wide by the keeper and Sunderland survive. For now. Joel Ikechi Oblates: I thought Sunderland were in this when they equalised? Looking at the table I guess their position is were they truly belong. Barney Kiddle: January can't come soon enough for Big Sam. Craig Andrew Smith: Defensively we've not been good enough, but at the same time have to admire #Everton's performance. They have been outstanding. Seven goals in the first match on a Sunday is always good, isn't it? Like finding out it's rhubarb crumble for dessert after your Sunday lunch. Romelu Lukaku is enjoying himself now - doing the old Ronaldinho trick of looking one way and passing the other to release Everton down the right. The cross comes in from Kevin Mirallas, but Arouna Kone falls over in trying to get on the end of it. Does anybody know the score? I've lost count. On a serious note, are Sunderland missing Lee Cattermole? He went off injured in the first half. Everton's little magician Gerard Deulofeu is brought off - much to Sunderland's relief, no doubt. His replacement? Only Kevin Mirallas. Belete Eshetea: What a match we are having. If things continue like this, we might end up with the highest goals scored in a game. What's going on here? Did Big Sam take off his defence at half-time and not tell us? Perhaps he read his players a chapter from Steve McClaren's book of half-time team talks? It's been some implosion from his side who worked their way back to 2-2 and are now 5-2 down. Arouna Kone bangs in another. I'm sure if you give us a minute, we'll be reporting on another goal. Romelu Lukaku is through on goal, he rounds the keeper and sidefoots home. And for those Fantasy Football managers out there, the assist came courtesy of Gerard Deulofeu's sublime sliderule pass. Richard Parfitt: Deulofeu wins the most ridiculous dive of the season so far. The defender was closer to bringing me down than he was Deulofeu. This game is turning into a cracker. Everton re-take the lead in fortuitous circumstances when Gerard Deulofeu's cross from the right is turned into his own net by Seb Coates. The defender got to the ball before Romelu Lukaku and just poked it past the keeper. To make the goal extra special for Everton fans, Coates is a former Liverpool defender. That's an awful dive from Gerard Deulofeu who flings himself to the floor in the penalty area after losing control of the ball. Play continues and 60 seconds or so later, the Spaniard is booked for simulation. And quite right too. Who is the most naturally talented player never to win a trophy? Nonso: Jay Jay Okocha, he won nothing at the club level. Euan MacTaggart: Juan Roman Riquelme. Best passer of a ball I've ever seen but never won a major trophy. Shows what I know, hey? Sunderland are level - and Everton only have themselves to blame. Jermain Defoe has the ball in the corner, he passes to Patrick van Aanholt who stands up a cross from the left andSteven Fletcherbeats Ramiro Funes Mori in the air to head home from six yards. Plenty of chances to stop that goal. None taken. 2-2. Big Sam looks very agitated on the touchline, as though he can't remember where he put his car keys. Everton have started the second half better than his side. Matthew Hearn: What about Emmanuel Adebayor? Don't think he ever won anything and has played for Arsenal, Real Madrid and Man City! Nilesh Patel: Most naturally talented footballers never to win a trophy has to go to Matt Le Tissier, Saints legend. Sunderland manager Sam Allardyce is late to return to his seat after half-time, and he emerges from the tunnel holding a very small mug of tea. I think it was a small cup, and it's not because Big Sam has giant hands. Let's get this second half up and running, shall we? Mike Hall: Can anyone else smell a Jermain Defoe hat-trick today? Going back to Jermain Defoe, who are the most naturally talented footballers never to win a trophy. Get involved using #bbcfootball. Is it unfair to suggest Jermain Defoe should have achieved an awful lot more in his career for a man who clearly was born to score goals. Am I right in thinking he has never won a trophy? Luke Street: Jermain Defoe that was naughty... Great goal! Matt Lee: Oh Defoe, you beauty!! The stats keep on coming today - Jermain Defoe has scored in five of his last eight Premier League appearances at Goodison Park. He loves it on Merseyside. The blue half, at least. As an idea of how that near 75% possession is being used by Everton, take a look at the two teams' heatmaps. I don't need to tell you that Everton are on the left. But with a man like Jermain Defoe up top, Sunderland can never be discounted. Well, that's changed things a little. Jermain Defoe has got a nose like a cocker spaniel when he gets a sniff of goal. He collects the ball just outside the area, gets in front of John Stones and then nips the ball past Ramiro Funes Mori before a neat finish deflects off Stones and into the back of the net. Steven Fletcher from 12 yards out. A tame low shot is straight at Tim Howard. Some nice approach play from Sunderland, but twice they ruin a chance to get a shot or header away with poor delivery. Jack Rodwell is the culprit the first time around. Everton are bossing this game now. They have a firm lead and are dominating possession. Ross Barkley has plenty of tricks and is capable of match-winning performances. But he also throws in the odd rick. He spurns a great opportunity for Everton to test Sunderland when he overhits a pass to Gerard Deulofeu on the edge of the box and the Toffees are pressed back to the halfway line. PtheP: How the devil are Everton even ahead, let alone 2-0? Max Baggins-Craig: Great deserved goal for Kone, can always rely on him to deliver, very good link-up play too. Everton top 7 easily. Lee Cattermole won't be getting a yellow card today. He's succumbed to injury and is to be replaced by Jack Rodwell. Sunderland are temporarily down to 10 men. Plenty of shots in this game, seven for Everton to Sunderland's six, but it's the ones with the little football next to them that count. (Green arrows are on target, red off target, and yellow are blocked shots). Has Roberto Martinez done a job on Big Sam here? The Sunderland boss pushed his wing-backs forward early doors and, like a great counter-attacking fighter, Everton waited to land a couple of swift jabs. The Black Cats are on the canvas now. Gareth Barry, who was involved at the beginning of Everton's second strike, has gone above David James in the all-time Premier League appearances list today - only Ryan Giggs and Frank Lampard are above him. He looks good for a man of 573 top-flight appearances. I'm not convinced he's not touching up his hair though. There's not a single grey hair on his head. A superb goal from Arouna Kone, who drives a powerful left-footed shot into the roof of the net from just inside the area. It came at the end of a nice one-two with Romelu Lukaku. Sunderland have a mountain to climb now. Adam Johnson curls a shot wide after being teed up by Jermain Defoe. That goal, it must be said, has really taken the wind out of Sunderland's sails. Here's how Everton took the lead. The ball through was by Arouna Kone (number 9) and Gerard Deulofeu (19) did the rest. Andy McNamara: Have to say that's against the run of play. If Everton play to their true potential, they could achieve so much more. Everton defender Bryan Oviedo pulls his hamstring chasing after Jermain Defoe and has to be replaced. Brendan Galloway comes on at full-back. Suffice to say, this has been an open game so far. Up until that goal, it looked like Sunderland's 3-5-2 system was working quite well, given they had hit the post twice. These are the touches of wing-backs Patrick van Aanholt and DeAndre Yedlin, who have been causing plenty of problems for Everton. Will that change now Sunderland are behind? Seamus Coleman has a shot beaten away as Everton try and turn the screw. You don't rise through the ranks at Barcelona without being able to finish. Gerard Deulofeu puts Everton into the lead - against the run of play, it must be said - with a cool finish between the legs of Costel Pantilimon. He owes Arouna Kone a drink, though. What a superb defence-splitting ball from the Ivorian to put the Spaniard through on goal. And from there, there was only ever going to be one result. Rob Burroughs: Tbh, if Adam Johnson had a decent right peg, that's 1-0 for Sunderland. Good lord. Is Tim Howard going to have one of those days where he saves everything? He makes a superb stop to deny Jermain Defoe with a low shot. The follow-up from Adam Johnson smashes off the post and Howard then flings himself in front of Steven Fletcher's effort but is beaten to it by Seamus Coleman. A goal-mouth scramble of epic proportions. Everton, somehow, survive. Sam Allardyce, by the way, hates it at Goodison Park. He has lost each of his last six PL games against Everton (all with West Ham) overall and each of his last five top-tier visits to Goodison Park (with Bolton, Blackburn and West Ham). Big Sam won't like that. His Sunderland midfield allow Ross Barkley to get on the ball in a central position and to drive forward. The Black Cats' defence parts but the midfielder's shot goes wide. Jermain Defoe and Steven Fletcher look like they've been putting in the hours on the training field this week. The classic big man and little man combination helps Sunderland break and, after dragging four defenders out of position, Defoe slips the ball to Fletcher only for a promising move to break down. A tame shot from Romelu Lukaku trickles towards the Sunderland goal but is easily dealt with. Kelvin: So Oviedo starts for #Everton? What happened to Galloway? This will be team's third left back. Mr Chimps: Ha'way Big Sam, let's get a result today. And now a minute's applause for Howard Kendall. An Evertonian legend. Every man, woman and child is on their feet and clapping. Sunderland's gameplan is clear - long balls, a flick on from Steven Fletcher and the ball is worked down the left where Patrick van Aanholt smashes a shot against the post. Tim Howard was rooted to the spot. It's early doors, of course, but already Sunderland are snapping into the tackles, winning headers and making sure they are first to the second ball. Big Sam's got his boys fired up. A minute's silence is impeccably observed. And now we're under way. King Henrikh: Keep your eye on Yedlin in the midfield. He might just be the quickest player in the Premiership now and now has licence to go. Right then... it's almost time for kick-off at Goodison. First, however, Everton captain Gareth Barry and Sunderland skipper Lee Cattermole will lay a poppy wreath. It's totally unconnected to today's game, but a story in The Sun caught my eye this morning. It concerns Manchester City winger Jesus Navas, who apparently drives to training in an £8,000 Nissan Micra. It's far from the flashiest motor on display at Carrington. Fair play to Navas though. I'm sure it gets him from A to B and all that. Eashwar Rajan: Arsenal have used 21 different players in the PL. If that doesn't show depth, what does? Everton have only won one of their last five meetings with Sunderland (D1, L3), so they'll be looking to put that right today. As ever when I watch the Toffees, I'm looking forward to seeing Ross Barkley in action. With three goals and three assists this season, Barkley has already equalled his best-ever haul of goal involvements in a single Premier League campaign (also six in 2013-14). I disagree with Lawro there. Surely it's nailed on Sunderland will stay up now?! Quote Message: They haven't had an Allardyce before. He is like Pulis. It doesn't guarantee they will stay up but it gives them a chance. He will sort them defensively. But it all rests on what business he can do in January. As a businessman, if you are [Sunderland owner] Ellis Short wouldn't you give him £30m to get £110m next season? They haven't had an Allardyce before. He is like Pulis. It doesn't guarantee they will stay up but it gives them a chance. He will sort them defensively. But it all rests on what business he can do in January. As a businessman, if you are [Sunderland owner] Ellis Short wouldn't you give him £30m to get £110m next season? So, what has Big Sam been saying this week about the game against Everton? Not one to bask too long in the success of a derby win, he's already looking forward. "It's a huge task for us all and we have got to meet it head-on, but we have also got to enjoy ourselves," said Allardyce. "It's depressing that a football club of this size with these facilities has only won its first game in 10. "It cannot be all doom and gloom, it cannot be all depression because we will never get out of the problems we are in." So how can Big Sam bring a smile back to the players? Post-match pizza? Karaoke after training? Let us know your ideas. Eight goals in eight games, it's Jamie Vardy's energy but he has the ability to finish. There are a couple of unsung heroes in the Leicester team too. Marc Albrighton, he switches sides and makes goals for the like of Riyad Mahrez. I wouldn't have minded playing under Claudio Ranieri if he takes them out for pizza every week! Quote Message: It is not just pace but width, which Leicester have right and left. Vardy is the key to it. They have set up to get the best out of him. That goes back to Manchester United. Why don't they do the same for Martial? Mahrez has been almost as good as Vardy. But it is not just them. Schmeichel is a great keeper. They are not afraid of anyone. It is not just pace but width, which Leicester have right and left. Vardy is the key to it. They have set up to get the best out of him. That goes back to Manchester United. Why don't they do the same for Martial? Mahrez has been almost as good as Vardy. But it is not just them. Schmeichel is a great keeper. They are not afraid of anyone. Match of the Day 2 Extra has now finished, but those who have stayed tuned to BBC Two can watch a special programme looking at last season's Road to Wembley in the FA Cup. In the meantime, here's the final bit of analysis from John Hartson and Lawro. The subject? Leicester and Jamie Vardy. It will be another emotional occasion at Goodison Park today, with the Toffees playing their first home game since the funeral of club legend Howard Kendall. To pay tribute, supporters will applaud throughout the fourth minute. Kendall wore the number four shirt with distinction while a player at Everton. He would later become their greatest ever manager. Rian Hoskins: Van Gaal is tactically astute with the way he has organised that defence but is not utilising the attacking options. Wayne Rooney started at number nine against Crystal Palace, but for me he can't play there any more because he's not dynamic any more. For me, Wayne has still got the brain to play in behind the striker and the ability to play players through. He can still score too but he can't play up top, he hasn't got the legs. Quote Message: If you are a Man United supporter what do you want? Would you accept winning the league playing this way or with excitement and wingers like they used to have? Anthony Martial has to play through the middle with Wayne Rooney behind him. At the moment it is so slow. They go sideways and it allows the opposition to get into shape. If you are a Man United supporter what do you want? Would you accept winning the league playing this way or with excitement and wingers like they used to have? Anthony Martial has to play through the middle with Wayne Rooney behind him. At the moment it is so slow. They go sideways and it allows the opposition to get into shape. And now we touch on the subject of Anthony Martial. Why is he not being played down the middle? Having him shoved out on the wing is like asking James Anderson to bowl spin. You're never going to get the best out of him. Quote Message: Aston Villa going for Remi Garde is a gamble with the future. It reminds me of Pepe Mel at West Brom. If it was me, I'd go for David Moyes. Why take a chance on someone who has never managed in the Premier League? Aston Villa going for Remi Garde is a gamble with the future. It reminds me of Pepe Mel at West Brom. If it was me, I'd go for David Moyes. Why take a chance on someone who has never managed in the Premier League? I was with Villa's potential manager Remi Garde at Arsenal, Arsene Wenger brought him in as a young player, it wasn't a great fit to be honest. What a manager would have to do at Villa is cope without the money. It would be the current crop of players that he has to deal with. On the subject of Arsenal, I think their success was summed up perfectly by BBC Radio 5 live's John Murray yesterday. Basically, John said that Arsenal are now seeing the benefit of having a world-class keeper in Petr Cech between the sticks. How Chelsea would like to have the Czech back now, in the absence of the injured Thibaut Courtois? Times journalist Oliver Kay on MOTD 2 Extra: "I look at Arsenal and they are a team which might get 80-plus points but I think Manchester City can get more but it's just a case of whether City can perform to the level that they expect." Arsenal are two players from really challenging from the title. A striker is one. What would they do without Theo Walcott and Olivier Giroud? The other one is at centre-back. Per Meresacker is a weak link. Quote Message: This is Arsenal's best opportunity to win the league. They have so many attacking options and the league is so open. The thing about Arsenal is that they will always let you down. We are all waiting for the result where they lose at a West Brom or Stoke. This is Arsenal's best opportunity to win the league. They have so many attacking options and the league is so open. The thing about Arsenal is that they will always let you down. We are all waiting for the result where they lose at a West Brom or Stoke. Quote Message: For Manchester City, victories like yesterday - not playing well and winning - is massive if you are going to win the league.This year is going to be the easiest year to win the league. For Manchester City, victories like yesterday - not playing well and winning - is massive if you are going to win the league.This year is going to be the easiest year to win the league. Manchester City expect to win it, which is not the same for Arsenal. Wilfried Bony is a player, he is a brilliant player for the likes of Raheem Sterling and David Silva, he can hold the ball up and is unselfish but when he gets on a run and feels confident, you will see the best of him. I'll stick with him on that one. Another attacking line-up from Roberto Martinez, who has Romelu Lukaku as the Toffees' focal point. There's starts for Ramiro Funes Mori, Bryan Oviedo and Arouna Kone as Everton make three changes. Seamus Coleman, who was a doubt, is fit to start at right-back. Sunderland, meanwhile, make four changes to the team which beat Newcastle. Three of those changes are at the back with Patrick van Aanholt, Seb Coates and Wes Brown all coming into the team. A defensive reshuffle - can Everton take advantage? We've been asking you to vote on whether you think Chelsea should stick with Jose Mourinho as manager. The answer, according to you, is a resounding yes, with 68% saying he should stay, and only 32% saying his time is up. Quote Message: They have really taken to Jurgen Klopp at Liverpool. He gets the club and the history. It is about the progression of the side. They are pressing the opposition. They kept the ball well but didn't do too much with it for 40 minutes. The key to the game was the goal just before half-time, which shellshocked Chelsea. If he was your manager you would want to play for him. They have really taken to Jurgen Klopp at Liverpool. He gets the club and the history. It is about the progression of the side. They are pressing the opposition. They kept the ball well but didn't do too much with it for 40 minutes. The key to the game was the goal just before half-time, which shellshocked Chelsea. If he was your manager you would want to play for him. Never mind Jose... what about Jurgen? Klopp's Liverpool team have lift-off following that victory at Stamford Bridge. Although the German did laugh when somebody asked if the Reds can now be considered title contenders. I think Chelsea will stick with Jose Mourinho even if the poor run remains. Who do you replace him with? It is time Roman Abramovich stuck with a manager long term. But is Jose Mourinho a manager for a long-term job? Players who have run through brick walls for him in the past have stopped doing that. It's that time of year when a host of Premier League clubs release Halloween videos of one player scaring another player. Sunderland did just that this week and, to be fair, it's pretty good. Let's just say there's a few players up at the Stadium of Light who are wary of things that go bump in the night. Can Everton break Black Cats down? Quote Message: I think it will be difficult for Everton. I was at the Wear-Tyne derby and although the penalty changed the course of the game, Sunderland hardly budged, really. If the full-backs got forward, they would have cover from midfield, so this week the onus will be on Everton. They will have 70% possession but the question comes if Sunderland then get themselves in front. Can Everton break them down? I think it will be difficult for Everton. I was at the Wear-Tyne derby and although the penalty changed the course of the game, Sunderland hardly budged, really. If the full-backs got forward, they would have cover from midfield, so this week the onus will be on Everton. They will have 70% possession but the question comes if Sunderland then get themselves in front. Can Everton break them down? How is everyone? Pumped for some Sunday football? Of course you are. Do you think Everton's Ramiro Funes Mori... sorry, Jose... sorry, Funes... oh, forget it... has an identity crisis? Well, the Everton fans are going to be finding out a lot more about him in the next few weeks as he fills in for Phil Jagielka in the heart of the Toffees defence. One thing is for sure, the 24-year-old, who joined Everton for £9.5m in September, won't be fazed by playing in the Premier League. If you can handle River Plate v Boca, at home to Sunderland should be a breeze. Match of the Day 2 Extra has just started and you can watch it at the top of this page. Will Perry is joined by John Hartson and Mark Lawrenson. Sunderland have happy memories of playing at Goodison Park. Their only Premier League away win in the last 16 attempts came at Everton in May. The 2-0 win also ended Everton's unbeaten home record in 2015 with their victory in May. Even Danny Graham scored. Right then, today's games. Everton v Sunderland is first up at 13:30 GMT, meaning we'll have some team news for you in about 30 minutes time. As a little heads up, I can tell you that Seamus Coleman is a major doubt with the stomach bug, adding to Everton's defensive problems. They will definitely be without Phil Jagielka (knee). However, Leighton Baines is back in training after a lengthy absence. Sunderland will make late decisions on John O'Shea, Younes Kaboul and Ola Toivonen, who all suffered injuries in the win over Newcastle last weekend. Former Chelsea assistant manager Ray Wilkins has been on BBC Radio 5 live's Sportsweek programme this morning, discussing the problems at Chelsea and Jose Mourinho's future. "The manager has his job and he will pick a side he feels can win, then It’s up to players on the pitch," he said. "Their lethargy without the ball is apparent - they don't have the same determination they had last season and the desire to win the ball back isn't there. "In any dressing room, if a player isn’t selected, he isn't happy. You keep 11 people happy, the rest are disgruntled. "I think Jose will stay in the job. Look at who can take over. Only Carlo Ancelotti is out there who could come in but I can't see them replacing Jose." Football’s equality and inclusion organisation Kick It Out wants to hear from those involved in grassroots football – whatever their role might be. The aim of the survey is to find out what Kick It Out can do to support those involved in the game at this level. By understanding those needs, Kick It Out will try and help make it more accessible and encourage those wanting to get involved. All survey responses will be treated anonymously. Email addresses will only be used to send the research results. Find out more and take the survey here. As well as keeping you bang up to date with everything football-related right here, you can also follow the action across the BBC today. Match of the Day 2 Extra is on BBC Two and Radio 5 live at 12:15 this afternoon, where Mark Chapman and guests will be discussing the day's Premier League fixtures and perhaps events at Stamford Bridge on Saturday. At 14:30, you can listen to live commentary of theWomen's Continental Cup finalbetween Arsenal Ladies and Notts County Ladies on BBC Radio 5 live sports extra. At 16:00 you can listen to live commentary from St Mary's asSouthampton host Bournemouthin the south coast derby. And at 22:00 you can watch highlights of the day's Premier League games on Match of the Day 2, which is also on BBC Two (22:55 in Scotland and Northern Ireland). It was also a contrasting day for keepers on Saturday. Jack Butland and Petr Cech had stormers for Stoke and Arsenal respectively, but England and Manchester City keeper Joe Hart had an afternoon to forget as his clanger almost gifted Norwich a draw at the Etihad. On Halloween, you won't collect any sweets unless you knock on some doors. And if you're Manchester United, you won't score any goals unless you create some chances. It was another frustrating day for Louis van Gaal's side on Saturday as they struggled to fashion anything and, thus, failed to score. Fortunately for them, their defence held up their end of the bargain and kept a clean sheet. But clean sheets don't get supporters' blood flowing (and if they do I imagine the fan in question owns at least one half and half scarf). Hence the United fans chants, nay pleas, of "We're Man United, we want to attack." Vardy, Ighalo and Mahrez probably don't earn between them in one week what Wayne Rooney pockets, yet all three are outshining the Manchester United forward at the moment. It was another bad day at the office for the England captain yesterday as United drew 0-0 at Crystal Palace - a result that did little to appease the away fans or the critics (including Paul Scholes) who have claimed United are boring. How did you end your slump? After Chelsea's poor start to the season, we're asking how you ended your slump? Get in touch via #getinspired or text via 81111 in the UK only. Jamie Vardy isn't the only surprising name at the top of the Premier League top-scorers list. Watford's Odion Ighalo and Vardy's Leicester team-mate Riyad Mahrez are joint second with seven goals each. Both bagged a brace yesterday. Vardy was recently playing non-league football, Ighalo was on loan at Granada not that long ago, while Mahrez was grafting away for Le Havre's second team. Just goes to show that you don't have to spend a fortune to recruit a superstar. Jose Mourinho has dominated our discussion all morning and is on the back pages of most of the papers. So we want to know: Should Chelsea keep him as their manager? Vote now at the top of the page. The vote closes at 12:30 GMT and terms and conditions can be found here. Premier League leading goalscorer Jamie Vardy. As statements go, it is as unlikely as 'fair play-award winner Lee Cattermole' or 'long-serving Leeds manager Steve Evans'. Yet, Vardy cannot stop scoring. The striker bagged for the eighth league game on the bounce yesterday as Leicester won 3-2 at West Brom. Only Ruud van Nistelrooy (formerly of Manchester United) has a run longer than this (10 games). In case you needed reminding, the 28-year-old was playing non-league football five years ago. There's hope for all of us yet. OK, maybe not all of us. My professional football dream died with tie dye T-shirts and the film career of Vanilla Ice. Here's one for Manchester City fans with memories stretching back beyond their mega-money days. Happy birthday lads. That kit, though. Oh brother. With the champions choking, two teams are leading the charge to usurp them: Manchester City and Arsenal. Both won yesterday, although in very differing circumstances. Table-toppers City did it the hard way, taking an age to break down a stubborn Norwich and then nearly throwing the win away (literally - looking at you Joe Hart) before snatching a last-gasp win. Arsenal were given a bit of fortune (when Laurent Koscielny's goal was allowed to stand) but ultimately deserved their 3-0 win at Swansea. Only goal difference separates the two at the top of the table. While Jose Mourinho's demeanour was gloomier than a Lars von Trier marathon at Droopy's house, Jurgen Klopp bounced out of Stamford Bridge with a grin wider than the Mersey. His Liverpool team were fantastic and provided the first real indication that the poorly-played symphony of Brendan Rodgers is being transformed into the heavy metal of his German successor. When he arrived, Klopp announced that he wanted to turn "doubters into believers" at Liverpool. Yesterday's game at Stamford Bridge was his water into wine moment. "I have nothing to say" was his sole response when asked about the game, although he did state that he would remain in his job before adding: "The fans aren't stupid. They know how much myself and the players are trying." A brief respite from pouring over Chelsea's continuing woes to point out that the reason we are here today is for two more Premier League matches. First up, at 13:30 GMT is Everton v Sunderland before the south-coast derby between Southampton and Bournemouth at 16:00. Much more on these games later. With Jurgen Klopp and Sam Allardyce making good early impressions in their new jobs (and Jose Mourinho potentially about to vacate his), we're keen to hear from you with your examples of changes the team you play in has made to end a slump. Did your boys make some radical changes to stir things up? Change the kit? Stick the keeper up front? Bring in a witch doctor? Send your tales to us either via Twitter (using the hashtag #getinspired) or text (81111 - UK only). Mourinho also dominates the back page of the Star. Although, they do also bring us a juicy bit of transfer news in the shape of a tussle between the Manchester clubs United and City for £30m Anderlecht teenager Youri Tielemans. I bought him once on Football Manager. Said he was homesick after a month. I hate him.